Today is White Ribbon Day, an international male-led campaign to end violence against women. It is the start of 16 days of activism against violence against women. The Royal Women’s Hospital is a leader in preventing and responding to violence against women through our advocacy efforts, services and our support for women who have experienced violence. 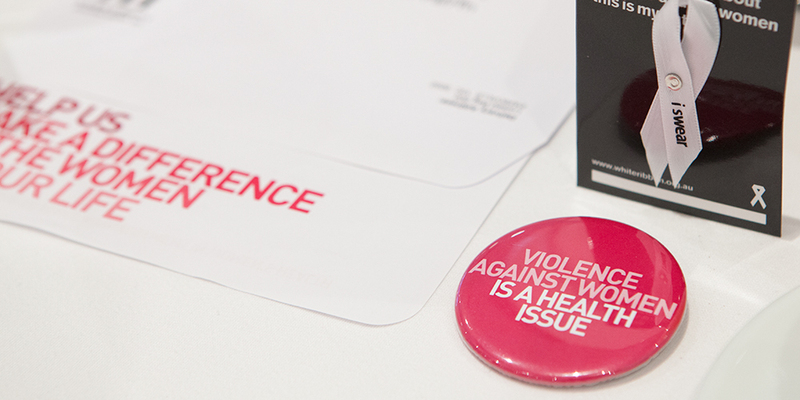 The hospital offers a safe place for women to talk to health professionals if violence is affecting their lives. Violence against women extends across all socio-economic classes and is the leading cause of ill-health, disability and death among Victorian women aged between 15 and 45. The leading cause – that’s more than breast cancer, more than heart disease, and more than high blood pressure, smoking and obesity combined. According to the World Health Organisation intimate partner violence is the most common form of violence against women, affecting 30 per cent of women worldwide. A minority of men are violent against women, but it is the majority of men who can make a change and help stop this violence. The change starts with you, with your words, your attitudes and your behaviours. A/Prof Mark Umstad, the Women’s Director of Maternity Services, said he was honoured to work in an organisation that promoted activities like ‘White Ribbon Day’ and ‘Acting on the Warning Signs’. “It is impressive to see how effectively these programs not just highlight the issue of violence in our community, particularly against women, but importantly offer solutions,” A/Prof Umstad said. What men can do to help prevent violence against women? If you hear a derogatory comment made about women or see someone acting disrespectfully towards women, speak up about why it’s wrong. It is up to men to foster a home, social and work culture in which violence against women is unacceptable. This includes setting an example for your children, promoting respect for women, addressing sexual harassment in the workplace. Behaviours that objectify and degrade women all contribute to a culture in which people feel they can condone or justify violence against women. Be aware of how your behaviour influences others.